Walter Mabry: This is the key to every computer system on the planet. I want *you* to steal it for me. The sequel to the 2013 surprise hit Now You See Me. 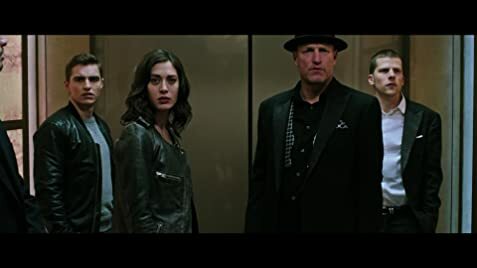 This movie brings back Jesse Eisenberg, Mark Ruffalo, Woody Harrelson, Dave Franco, Morgan Freeman and replaces Isla Fisher with Lizzy Caplan which in this movie makes sense and works well for what they are given. This movie takes place about a year and a half after the first movie ended, the horsemen have been in hiding since then. Because of that they have become bored and want to get back into the limelight and showoff their magical abilities. However in doing so they are caught by Daniel Radcliffe's Walter and forced to commit some more magical heist but instead for the wrong reasons. When this movie started I was worried that it would be a rehash of the first film, the horsemen use their magic to bring down a big corporation but as the movie continues the story takes a turn for the better and introduces the new characters and ideas. When it comes to the performances Mark Ruffalo is great in whatever movie he is in, Dave Franco did the best with what he was given, Daniel Radcliffe showed some range playing a villain and Woody Harrleson is one of the funniest actors currently working. The only negatives for this film is that it is a slight downfall from the first movie because the first was such a unique experience and seeing it a second time will never be as impressive. Jesse Eisenberg plays his same kind of character, egotistical maniac. Most of the moments that didn't revolve around the magic and illusion where a little slow and Woody Harrleson for some reason plays two characters in this movie, which at time felt very strange and a little unneeded. 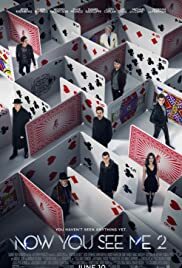 Overall this is an enjoyable magic heist movie with some funny moments, good acting, a great cast and one of the best heist moments involving a playing card. Overall I recommend this, especially if you enjoyed the first one or enjoy fun movies.